20 kilometers doesn’t sound like much to walk, especially if it is mostly downhill. 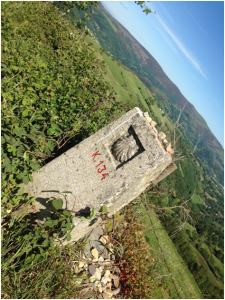 20 kilometers on the Camino de Santiago, however, is probably more like 23 or 24 kilometers. The markers are not very accurate, and they lull you into thinking, “I’m halfway there!” or “Only two more kilometers to go!” Both thoughts are serious mistakes, and will get you thinking WAY too early that respite is not too far away. Oh, and the downhill thing? Harder than uphill. Most injuries happen going down, not huffing and puffing up. Today was our first day on the Camino. The students were instructed they could walk – at the most – in groups of three. Large groups are impenetrable, while 2 or 3 people walking together are the start of a conversation when coming upon other pilgrims on the Camino. I started out a good two hours ahead of the students this morning. It is imperative to guide, but not filter. Too much time with them makes me explain, instead of making them ask questions. In Spanish, of course! My walk today was Paradise. The students had their own reactions. Amanda V: The views are breathtaking, and they look like they were taken from a painting and plastered into the sky. Lindsey W: Pictures will NEVER do justice to the beauty of the Camino. The pilgrims are special people, the food is beyond delicious, the way is long, but I never once wished it were shorter! Heidi P: The trip has exceeded my already high expectations. Tess T: Never have I met so many people, seen so many unforgettable sights, spoken so much Spanish, or been so thankful for all the people and events in my life that led me to this place. I wouldn’t trade the Camino for anything. That is after one day. And there are blisters involved already! We ended the day today in Triacastela, meaning “three castles”. None of the three medieval castles are in existence today. Instead we discovered an enchanting small town in Galicia, warm and welcoming. Tomorrow offers us two options: a shorter day’s walk with a significant uphill climb (read 2600 feet), or a longer day’s walk that will take us past the Monastery of Samos, one of the oldest in Spain and the western world. The students will choose their own destiny, and we will talk about it upon arrival in Sarria! Tomorrow’s reflections: How is the Camino different or similar to what you expected it to be? How does that change your goals for the trip?